What Are the Best Organic Energy Drinks? There's no doubt energy drinks are very popular but they are also surrounded with negative health concerns. Below we will go over ingredients you need to watch for and suggest a few good brands that make organic energy drinks. Fact: Energy drinks are bad for you. If you walk into any convenience or grocery store in the world, you’re likely to see an entire wall of different energy drink options. Each drink comes with its own set of bold claims and its own set of potentially harmful ingredients. But, everyone needs a pick me up from time to time, so for many, energy drinks have become a part of our everyday lives. Fortunately, there are plenty of healthier alternatives that rely on natural and organic ingredients instead of artificial ones to give you the buzz you’re looking for, like these five options below. What’s Wrong With Regular Energy Drinks? While nearly everyone loves the quick and convenient buzz that an energy drink can provide, it does come at a cost. There are many risks and dangers to be aware of when it comes to energy drinks. Caffeine is a drug, and like all drugs, there are withdrawal symptoms you may experience when you discontinue use. Regular energy drink users often experience symptoms like headaches and migraines if they haven’t had their caffeine fix. The ingredients contained in energy drinks can raise a person’s blood pressure as they consume the drink. For people with normal blood pressure, this isn’t much of a concern. However, for people who are already dealing with high blood pressure, the spike in blood pressure caused by energy drinks can have very serious health implications. Sugar, sugar and more sugar: that’s what you can expect to find in most energy drinks, and sugary drinks are a leading cause of Type 2 diabetes. While all of the ingredients in major energy drinks are entirely legal, not all of them are completely safe. This is especially true when it comes to energy drink users who are taking prescription medications. If you’re taking medications, you should consult with your doctor to ensure none of the ingredients in energy drinks interfere with your medications. Most energy drinks include a high therapeutic dose of vitamin B3 (niacin). While vitamin B3 is a necessary vitamin you need to be consuming on a daily basis, it’s also widely available in other foods, drinks and supplements as well. Taking too much vitamin B3 can lead to a niacin overdose can lead to a number of side effects, including the development of nonviral hepatitis. The Mayo Clinic recently conducted a study which suggests that energy drink consumption leads to an increase in the release of the stress hormone norepinephrine. (5) Participants who consumed an energy drink before the study experienced a large spike in this hormone compared to the control group. While all of the individual ingredients in energy drinks are entirely safe and many of them are found in other foods and drinks, they can be potentially dangerous when consumed in high quantities. Here are some of the ingredients commonly found in energy drinks which can be dangerous when ingested at high levels. Nearly all major energy drink brands pack their beverages full of high fructose corn syrup, or in some cases, sugar. At the same time, the diet versions of these drinks which are also quite popular contain high levels of artificial sweeteners. These ingredients can lead to obesity, type 2 diabetes, tooth decay and metabolic disease. Caffeine on its own is fine in small doses. However, energy drinks usually pack tons of caffeine into each serving. When coupled with other popular energy drink ingredients, this can lead to irritability, insomnia, nervousness, anxiety, nausea, dehydration and more. On average, a 16-ounce energy drink contains as much caffeine as six servings of coffee. File this one under ‘too much of a good thing.’ While B vitamins are necessary for good health, many energy drink companies overdo it, especially with vitamins B3 and B6. In excess, these vitamins can cause a litany of different conditions such as skin conditions, liver toxicity, blurred vision, and gastrointestinal problems. Taurine is usually one of the most popular ingredients in energy drinks. It’s a naturally occurring amino acid that supports neurological development and regulates the amount of minerals and water in the blood. But, too much Taurine can result in low blood pressure. Moreover, taurine hasn’t been studied for long enough for us to understand the potential long term hazards of its use. Another popular addition to the energy blends of many companies is Guarana. Guarana is derived from a plant that’s native to South America that’s prized for use as a stimulant or weight loss aid. The seeds of the plant, which are often used in energy drinks are very high in caffeine, which we’ve just discussed the dangers of above. Coupled with the other caffeine sources present in an energy drink, potential side effects are exasperated. Fortunately for us, not every energy drink brand is brimming with artificial ingredients, flavorings, and colors. There are several alternatives available that offer healthier, cleaner energy than the big guys you’re likely to find at the gas station or grocery store. 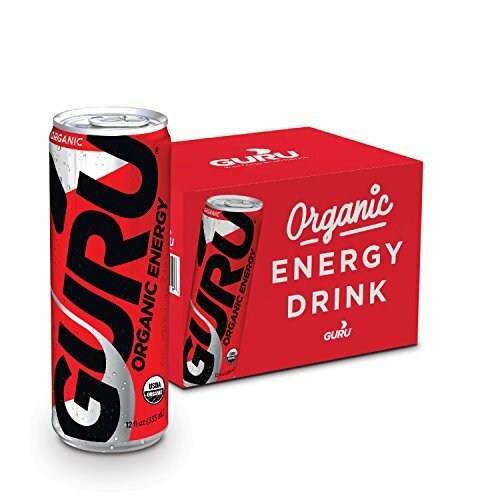 With nearly 20 years experience, the folks behind Guru energy drink have created a tasty organic alternative to the big energy drink brands. Guru manages to provide its boost without the help of caffeine from unnatural sources or taurine. Each 12 ounce can contains natural fruit juices, green tea leaf extract, guarana seed extract, Panax ginseng extract, and echinacea extract. It’s sweetened with organic cane sugar syrup. You won’t find any artificial ingredients, flavors, sweeteners or preservatives in this drink. Every ingredient in Guru energy is certified organic, non-GMO, gluten-free and vegan, which makes Guru a great alternative for those with a gluten sensitivity or a vegan diet. The folks behind Runa energy drink bill it as “organic, clean energy from a leaf, not a lab” and for a good reason. In total, Runa contains a total of six ingredients, which is a far cry from other popular alternatives which feature a laundry list of artificial ingredients. 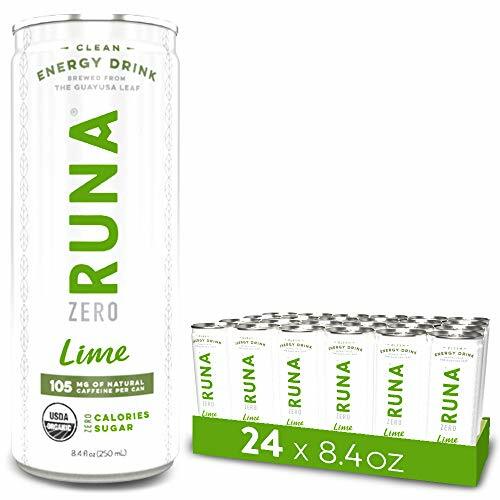 Runa derives its energetic properties from the Guayusa leaf, which has been used by Amazonian tribes for thousands of years to provide them with the boost they need to start their day. This leaf is packed with naturally occurring caffeine. Runa also adds polyphenols, which makes this drink rich in antioxidants. Outside of Guayusa, the only other ingredients are natural flavorings, citric acid, and vitamin C.
This drink is certified organic, fair trade and non-GMO. Best of all, Runa is committed to reforestation efforts in the Ecuadorian Amazon, and they work with over 3,000 local farming families to support the communities that make this energy drink possible. 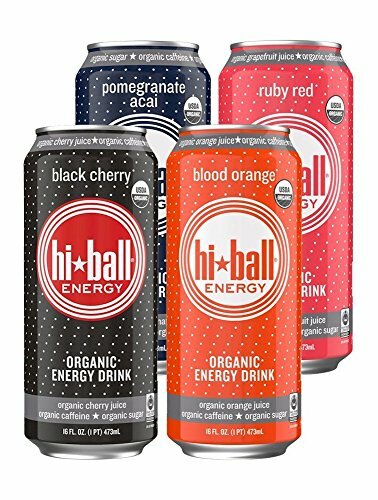 Hi-Ball organic energy drink is a great option for fans of Red Bull and other popular energy drink brands because it manages to maintain that signature energy drink flavor without all of the artificial ingredients and additives. Each can of Hi-Ball contains guarana and Panax ginseng extracts, natural caffeine and B-vitamins. All of the ingredients are certified fair trade and organic. Hi-Ball is sweetened with organic fair trade cane sugar syrup. If you’re looking for variety, Hi-Ball may be a particularly good choice for you. They manufacture several different flavors of energy drink, as well as sparkling energy water and even cold brew coffee drinks as well. Choose Organic: All the ingredients are natural - no artificial flavors, preservatives, colors or refined sugars and no GMO ingredients. Just as nature intended. One of the most popular organic energy drink alternatives is Scheckter’s, and after you taste one it’s easy to see why: this stuff is seriously delicious. Scheckter’s is flavored with pomegranate, elderberry and lemon juice, which is a delicious combination if you ask me. Scheckter’s derives its caffeine from organic green tea and green coffee beans. They round out their energy blend with organic guarana and ginseng. Then, it’s naturally flavored with fruit juices and raw cane sugar. Scheckter’s is organic, fair trade, non-GMO and vegan. They also carry the approval of Informed Sport, which makes them the first and only energy drink company to come with the Informed Sport recommendation. That way, professional and amateur athletes that are subject to doping restrictions can feel confident knowing that they’re not inadvertently ingesting a banned substance. 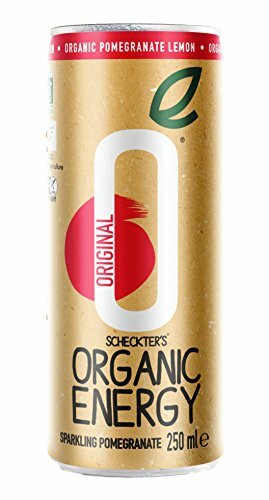 If you’re watching your calorie intake, you may want to avoid this delicious cocktail, as Scheckter’s manages to pack in 118 calories per 8 ounce serving, which is the highest of these five organic energy drinks. 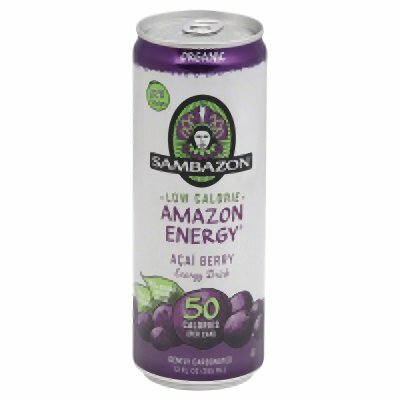 Sambazon turns to the powers of Acai to develop their tasty and effective organic energy drink. Each can of Sambazon contains as much caffeine as two shots of espresso, thanks to its energy blend of organic yerba mate, green tea, and guarana. It’s also packed with powerful antioxidants thanks to its healthy dose of Acai juice. Sambazon combines organic cane sugar with organic stevia extract to provide one of the few organic energy drinks that are much lower in calories than popular competitors. Each 12 ounce can comes in at 40 calories, while most others are in the 120-140 calorie range. For that reason, Sambazon may be a great choice for anyone who’s looking for a kick but also watching their waistline. All of the ingredients in Sambazon are organic, non-GMO and sustainably sourced from the Brazilian Amazon. Sambazon also manufactures a line of snacks, frozen desserts, and juice drinks that are perfect for fans of Acai berries. While all of the drinks we’ve covered make a delicious and healthier alternative to the big energy drink manufacturers, there’s one choice we loved a bit more than the others, and that’s Sambazon. Sambazon manages to deliver delicious flavor, a powerful energy blend and sustainable, fair trade and organic ingredients without relying on tons of added sugar for its delicious taste. You may have a hard time believing that each can contains only 40 calories. Compared to other options which contain about as many calories as a can of Coke, the low caloric content of Sambazon is much appreciated, and for that reason, it’s our number one. What Are the Best Ketone Supplements?